What Exactly is a Web Application? One aspect of Bergbuilds that users may find a bit complicated at first is understanding the different accounts (and associated passwords) that you can manage as part of your participation in the project. This article outlines the types of accounts that you are likely to have, what they are for, and how you go about resetting passwords on each of them. 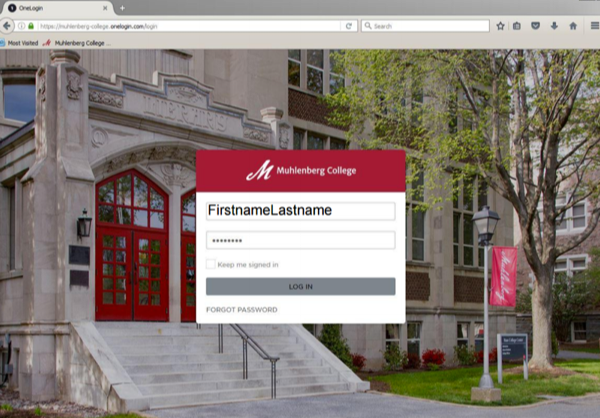 Access to Bergbuilds is available through Muhlenberg's Application Portal: http://login.muhlenberg.edu. Before you can sign up for a subdomain on Bergbuilds, you will need to know your username and password necessary to connect to the application portal. If you are unable to successfully connect, please contact either the Student Helpdesk or the Faculty/Staff Support Desk. Upon your first visit to the Application Portal, you may be asked to configure some security and recovery settings, but you shouldn't need to do this more than once. This will take you to the landing page for Bergbuilds. Look for the 'Dashboard' link in the upper right. Every time you install a new application through Bergbuilds (for instance, WordPress), an Administrator account for that application will also be created. This may be confusing at first. It's likely you will use these accounts very often -– every time you need to login to your application to manage the associated Web site, you will use this account. Consider installing a password safe, or coming up with some system to manage your usernames and passwords. Stated another way, if you install WordPress on your Bergbuilds site, every time you need to add content to WordPress, change your theme, approve comments, etc. you will use a unique account to login. This is not your Muhlenberg-provided network login, nor is WordPress handled by logging into the Application Portal. Whenever you install WordPress (or another tool available through the cPanel dashboard) you should receive an email confirming the userid/password combination you chose. This email will also have information about how to access the login page for that tool. You may wish to save this message for future reference. Login to the cPanel dashboard as described above http://login.muhlenberg.edu. Click on the 'Dashboard' or 'Get Started' buttons (see above). Find the application you installed under My Apps. Click the Edit button (this looks like a blue wrench). Scroll down to find the Administrator Username and Password. In addition, most applications should have some kind of password reset link on their login page. This will allow you to (typically) receive a password reset URL within an email. If you are unable to reset your administrative passwords for your Bergbuilds tools and apps, please contact the Student Helpdesk of Faculty/Staff Support Desk for assistance. Please be sure to mention you are requesting support for a Bergbuilds (or Domain of One's Own) site.